Our Land and Seabed Topography map shows the dramatic relief of the sea floor as well as the world’s major mountain chains. Mid-ocean ridges, seamount chains and ocean trenches are revealed in continuous-tone colour and hill-shading. Our standard topography map is shown on the land, including rivers, lakes and icecaps. 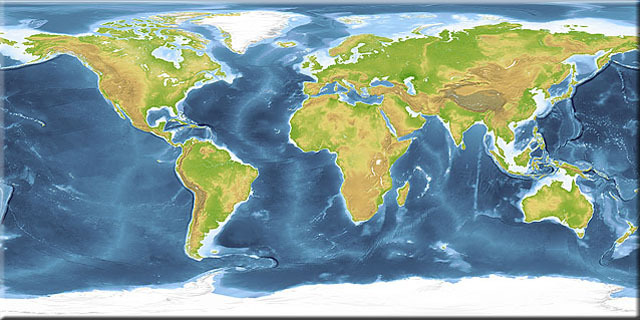 Both land and sea areas are largely derived from satellite radar observations, representing the latest and most detailed knowledge of the shape of the Earth’s solid surface. Click here for more information about our unique combination of ocean depth datasets.